Butterfly Reflections, Ink. 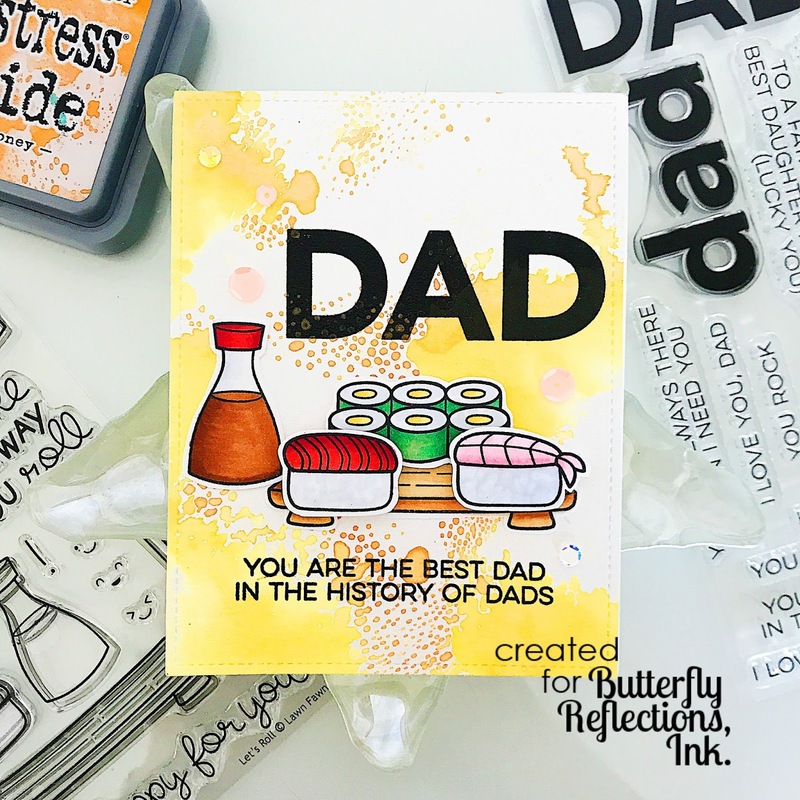 : Happy Father's Day! Happy Wednesday! 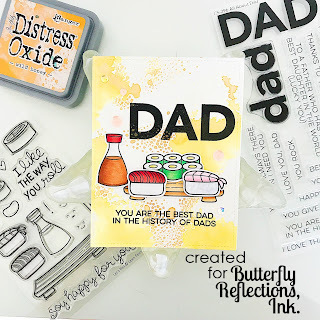 Lindsay here on the blog featuring a Father's Day Card using some new My Favorite Things products as well as some older Lawn Fawn products. I'll give you guys a little background for my card. I am my dad's sushi buddy as my mom won't go near it, which is so silly as she is part Japanese. 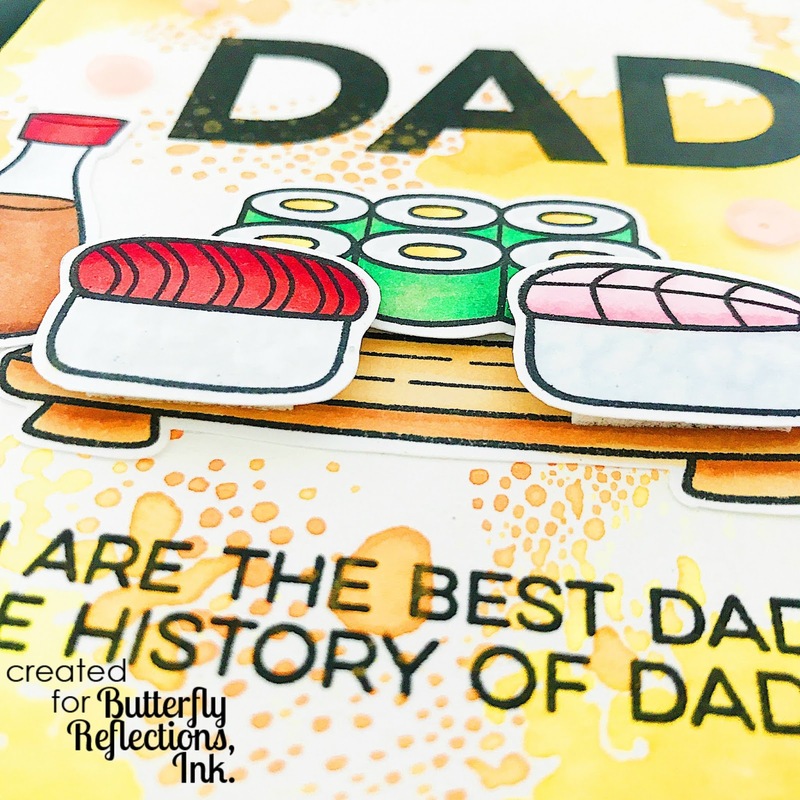 But never the less, our dad and daughter dates are usually accompanied by Japanese food, whether it be sushi, ramen, or simple izakaya food. Okay, now it's time to get back to the card! 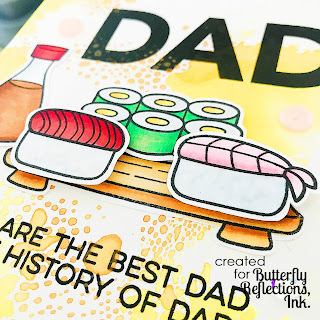 I started by stamping out the Let's Roll Stamp Set from Lawn Fawn using Copic Safe Black Ink onto Neenah 80# card stock. I then took out my Copic Markers and got to coloring! After finishing coloring I had to fussy cut out the images (EW!) (as I don't have the Lawn Cuts). I used these Spring Cut Scissors, which actually does help the process of fussy cutting to be a little less tedious. The scissors are actually a little bit fun to use! Then I got working on the background. 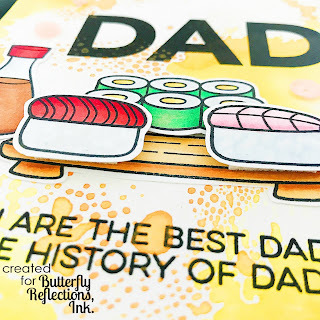 I did some ink smoothing using Wild Honey Distress Oxide Ink as my dad's favorite color is orange and this is the closest color to a pure orange that I have in my arsenal. 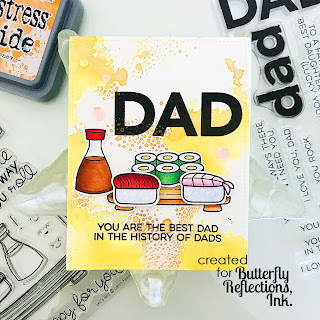 I stamped the large "DAD" and smaller sentiment using MFT All About Dad Stamp Set in Versafine Onyx Black Ink so that I could heat emboss it using Clear Embossing Powder. I usually try to clear emboss when using the Versafine ink as it takes a bit to dry and I'm impatient so I always end up smearing it if I don't emboss it. So sad! 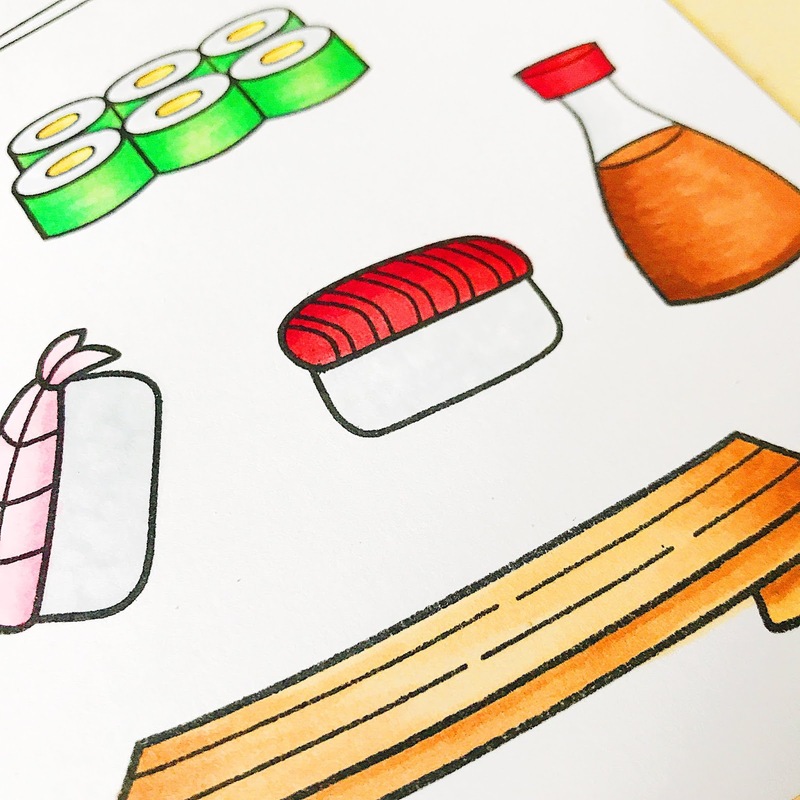 After finishing up the embossing I started arranging the sushi scene. I adhered the plate and soy sauce bottle straight to the background of the card using Tombow Mono Permanent Adhesive and then, using one layer of Foam Tape, adhered the maki style roll in the back and then with two layers of Foam Tape, adhered the nigiri rolls in the front. 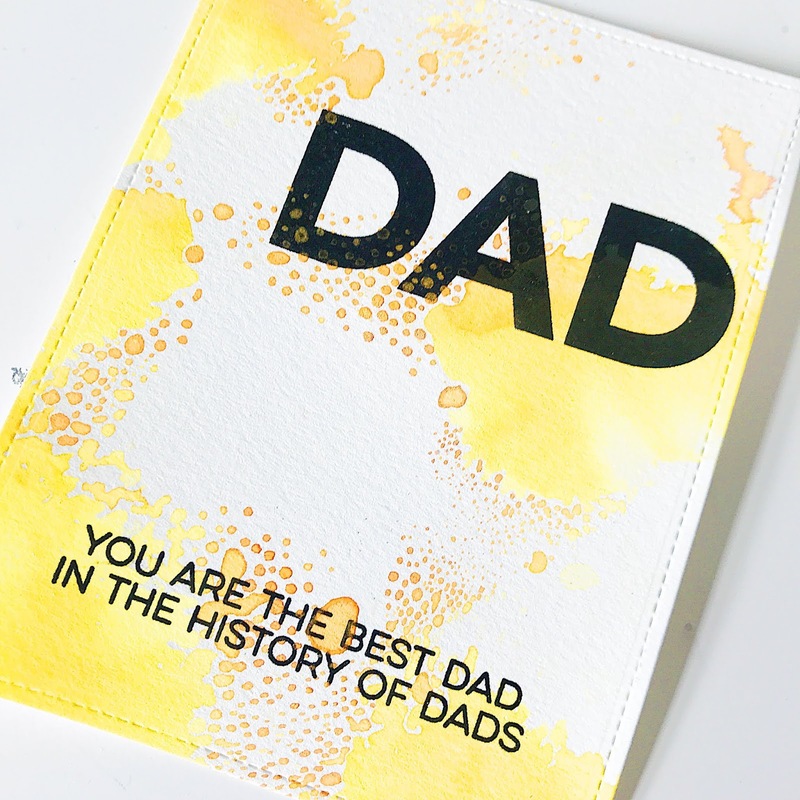 I then finished off with a couple Pretty Pink Posh Sequins, not that my dad is super into sparkle or anything but it's physically impossible for me to NOT embellish a card with Pretty Pink Posh sparkly things! And that's my card for today! Hope everything is having a great week! I'll see you guys next week with another card.